Why are you interested in osteology? I remember the first time I handled an animal skull in a science class at secondary school. All the other kids thought it was disgusting, but I was fascinated by it. Later when I went to university I got interested in funerary archaeology, and my interest in osteology grew from there. For me, osteology is capable of supplying us with information about both individuals and whole populations, in a way that other archaeological disciplines can’t. It’s completely amazing what the human body is capable of and what a skeleton can tell us. 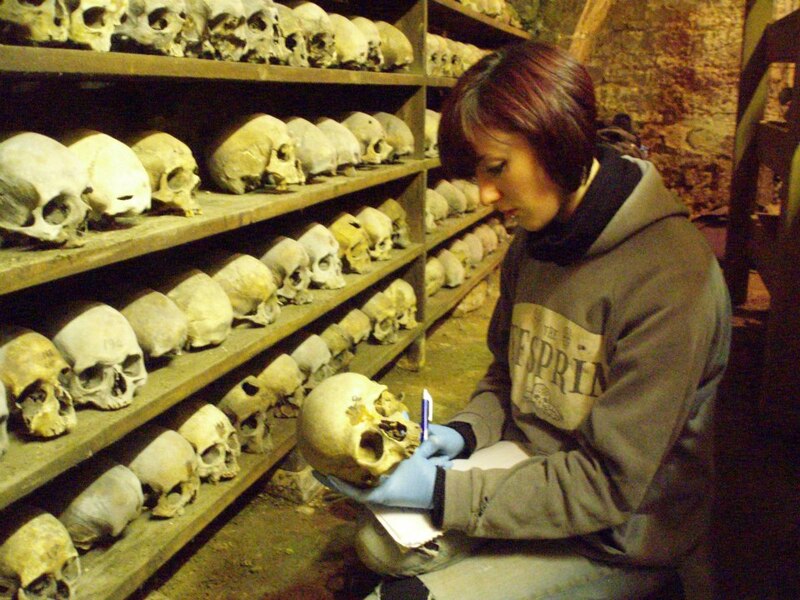 Why do you think the general public should be interested in human skeletal remains? Archaeology is all about interpreting and finding a connection with the past. There’s no greater connection than the physical remains of our ancestors. We’re constantly trying to understand who we are and where we came from, and archaeological human skeletons are the remains of who we once were. They tell us a story (no matter how big or small) on a very personal level that many people find they can relate to. That’s why skeletal remains and mummies are so popular in museum exhibitions – people can relate to them in a way that not everyone can relate to other archaeological finds such as pottery. What is the most interesting pathology you have found on a skeleton? Definitely the individual we found with fused knee and elbow joints at the All Saints Fishergate site in York. His left elbow and right knee were totally fused the joints so each limb was at a right angle. We’ve had numerous palaeopathology specialists examine him, and a number of tests done, but we still can’t figure out exactly what’s wrong. We ruled out trauma and a number of infectious diseases. I think it’s something that happened when he was young, because of the way bones such as the ulna and radius have developed. Whatever caused the two joints to fuse, it’s a very extreme, rare case. What is your main field of research within the discipline of osteology? At the moment I’m just writing up my PhD research. I’ve been reconstructing the population of Roman York using osteological evidence. I’ve been looking at the demographic composition of the population, have re-estimated the population size, been using dental pathology to try to figure out what sort of foods people were eating, and looking at non-dental pathology to examine health status. What is the oldest skeleton you have studied? I did a couple of osteological assessments of skeletons that turned out to be Iron Age (2nd century B. C.), from the University of Sheffield’s student field school at Brodsworth near Doncaster. The bones were in very bad condition, but during cleaning in the lab I found that one of the skeletons had pendants made out of pig tusk and a large tooth that could have belonged to a dog or a wolf. How difficult is it to excavate human remains without damaging them? It very much depends on a lot of factors! If you have a well preserved skeleton in good soil, a lot of time and decent weather, it can be relatively straight forward. However, as any field archaeologist will tell you, conditions are rarely optimum! Fragmented, poorly preserved remains can be very difficult to excavate without causing more damage. Things like time pressure and bad weather really don’t help, and it’s situations like this where both osteological knowledge and field experience are necessary in order to keep remains in the best condition possible. What advice would you give to anyone thinking of pursuing a career in the osteology? Make sure it’s a career you’re very dedicated to; there are a lot of very good osteologists in Britain so standards of practice are high and competition for jobs is fierce. If you decide that’s the direction you want your career to go, you need to make sure you get as much practical experience as possible. Books are great, but there’s no substitute for handling real material. I always recommend to our MSc students that they help out with cleaning our new collections – it might seem boring but you get to handle loads of whole and broken bone specimens, and it really helps you get to grips with identifying those pesky fragments!